Owen Ogletree's past ON TAP beer articles for Athens Magazine. Pairing craft beers with holiday foods for christmas and thanksgiving. ON TAP beer column in Athens Magazine. Looking for flavorful and interesting beverages to accompany festive holiday meals? Wines can be expensive and quite high in alcohol, eggnog is loaded with fat, and cocktails tend to send guests home way too early with their designated drivers. Why not experiment with craft beer? Today's crop of exciting, personable gourmet beers from small breweries around the world make for delightful pairings with a wide range of foods, and the diversity of colors, aromas and flavors of these brews are sure to ignite curiosity, conversation and interest among holiday merry-makers. Many say that beer's sweet malt, creamy carbonation and moderate alcohol content complement rich holiday fare better than any other libation. Crack a Southern Tier 2XIPA and a box of water crackers alongside a cheese platter of authentic English Stilton and Parmigiano Reggiano. 2XIPA, a hop lover's dream from the ingenious brewers at one of New York's most popular boutique breweries, embodies rich malt notes and dry, citrusy hop character -- a perfect harmony to earthy, aromatic cheeses. Skip the Champagne this year and sample the dry, bubbly Brooklyn Local One ale together with chocolate covered cherries or strawberries. Barley and hops from Germany, aromatic raw sugar and fruity Belgian yeast come together in this spicy golden ale, creating a world-class aperitif that's also scrumptious with caviar. 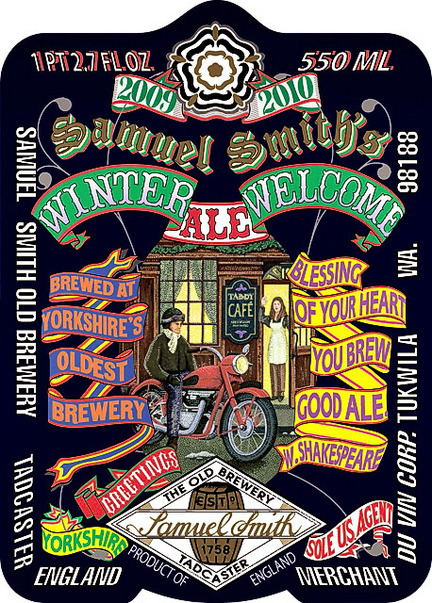 Seek out a caramely, classic English ale such as Samuel Smith Winter Welcome to pair with a main holiday course of roast turkey and sage dressing. Winter Welcome, a somewhat stronger than normal English brew, comes vintage-dated with a special, festive label each holiday season. Its honey/amber color, creamy white head, floral aroma and delicious malt and hop balance form an elegant, slightly fruity complement to any dish of mild poultry, pork or lamb. Look for this seasonal ale in 18.7 ounce single bottles or 12 ounce four-packs. Sip a glass of Avery The Kaiser Imperial Oktoberfest with a bite of squash casserole or pumpkin pie. The toasted malt charm of this rich beer goes extremely well with the slight earthiness of gourd veggies, and the flavors of the beer and food meld in the mouth, creating an elegant marriage of complex sweetness. Just in time for the holidays each year, Atlanta's SweetWater Brewing Company releases its popular Festive Ale. A potent, cinnamon spiced brown ale with deep flavors and 8.6% alcohol to keep one warm on a cold winter's night, this seasonal offering is brewed only one day per year. Savor a snifter of the beer alongside baked sweet potatoes topped with molasses and marshmallows. Brilliantly full-bodied and rich, Sierra Nevada Celebration Ale is a holiday brew utilizing extra hops added after fermentation to create a superb, grapefruit-like aroma. Healthy additions of English caramel malts produce a plush, red-wine-like ale that complements roast beef in first-rate fashion. Could a beer exist to enjoy alongside peanut butter cookies or frosted pound cake? Local Terrapin Beer Company's enchanting new Moo-Hoo Chocolate Milk Stout fills the bill. Additions of cocoa nibs from Olive & Sinclair Chocolate Company and sweet lactose sugar give this black brew its smooth, dessert-like quality. Look for the whimsical label with the Terrapin turtle dressed as a cow eating a chocolate bar. 9% alcohol Nøgne Ø Imperial Stout pours like dense, black motor oil but tastes like an elegant blend of espresso, caramel, rum and chocolate. Production of intense, flavorful, well-crafted beers such as this has earned Norway's first craft brewery an almost cult status among beer aficionados around the world. A dark, rich ale whose sublime sweetness is balanced by roasted malt bitterness, Nøgne Ø Imperial Stout pairs best with vanilla ice cream or brownies topped with roasted nuts. St. Bernardus Christmas Ale, regarded widely as one of the best Belgian strong dark ales in the world, exhibits a dark brown color with ruby highlights; a tall, creamy, full head; velvety body; and rich flavors of raisins, spice, plums, caramel and figs. Coming in at 10% alcohol, this powerful ale makes a great "sipper" beside spiced rum cake. Aside from the impressive 750 ml cage-corked bottles, the beer also comes in a mixed selection gift box with a souvenir glass.